Aromatherapy is the art and science of using natural aromatic essential oils. The "aroma" in "aromatherapy" refers to the fact that all essential oils have a characteristic smell, while the therapy refers to healing. Aromatherapy involves the use of essential oils, precious, sweet smelling liquids extracted from variety of plants, ie petals, leaves, roots, buds, twigs, wood, bark, resin or fruit. The essential oils enter the body through the skin, partly because their molecules are extremely small, and they are attracted to the bodily natural fats and fluids, allowing the pure oils to be compatible with the skin basic structure, penetrating it layer by layer, until they pass through into two transport systems, the circulatory and the lymphatic. These two systems allow the oils to be carried around to all the major organs, in order to detoxify and to regenerate every cell in the body. 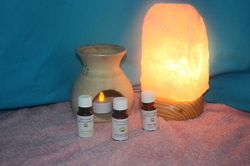 Essential oils in Aromatherapy can be used in variety of ways, such as in massage, creams and lotions, compressions, soaps, baths and sitz baths, vaporisers and oils burners. They have strong properties that enables them to reduce swelling and inflammation, expels mucus, relieving in coughs colds and flus, promotes circulation - blood and lymph, aides in muscular aches and pains, aides in digestive complications and promotes in healthy looking skin. Aromatic medicine was first coined by the French physician Dr. Daniel Peno`el in 2007. The name was given to help set apart the therapeutic use of essential oils from the English term “Aromatherapy.”Aromatic Medicine is a French approach that explores to integrate ‘aromatherapie’ into herbal practices. In France, where the use of “Aromatherapie” has often been in the context of “ptyo-aromatherapie”, where herbal extracts (tinctures, spray dried extracts) are used in conjunction with essential oils. · Oral ingestion – via capsules, cough mixtures, tinctures. · Topical via creams, balms, ointments and salves. · Vaginal – via suppositories and pessaries. · Eye, ear, nose and throat applications – via sprays, buccal and sublingual. In practice, aromatic medicine is generally employed as a form of naturopathic and complementary medicine. In this holistic way, essential oils are used as well for their indirect action on the total ‘terrain’ of the body, mind and soul. Psoriasis, Burns, Eczema/dermatitis, Acne, Boils, Wound management, Herpes simplex. Asthma, Bronchitis, Catarrh, Hay fever, Sinusitis, Sore throat, Upper Respiraotry Tract Infections, Tonsilitis. Constipation, Diarrhoea, Dyspepsia, Eating Disorders, Flatulence, Irritable Bowel Syndrome, Nausea and vomiting. Bruises, Chilblains, Hypertension, Palpitations, Oedema, Varicose veins. Arthritis, Backache, Bunions, Bursitis, Gout, Cramps, Sciatica, Strains and Sprains. PMS, Amenorrhoea, Dysmenorrhoea, Menopause, Endometriosis, Vaginal Candidiasis, Cystitis. Anxiety, Stress, Depression, Insomnia, Headaches and Migraines, Epilepsy, Shingles. Fever, Inflammation, Allergies, Candidiasis, Chronic Fatigue Syndrome.